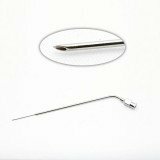 We offer injection and aspiration needles, such as angular septum needles and bayonet septal needles with luer locks for use in endoscopic sinus procedures. If you don't see the pattern you are looking for, contact us. We can reference any catalog number from any company.